Hall of Gods is an online video slot machine game from Net Entertainment that was released in December 2010. This video slot game has 5 reels and 20 pay lines. Many online slots players love playing at Hall of Gods because it comes with a very exciting Triple Progressive Jackpot prizes! The Hall of Gods theme is inspired by the stories of Norse mythology. 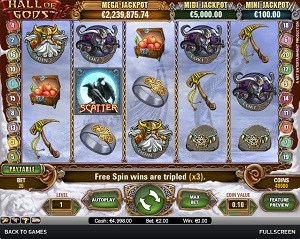 The theme of Hall of Gods mostly centers on the adventures of Vikings in the sea, where Jormungand, the Midgard Serpent, lurks for its prey; this online slots game features Free spins with multipliers, Expanding Wild symbols, scatter wins, and last but not least, a bonus game that gives a chance to win 3 different Progressive Jackpots! What most online slots players love about Net Entertainment is that they let everyone to play instantly on their slots games without them having to download any software at all! With 3 different Progressive Jackpots on offer, a Free Spins bonus game with multiplier features, Expanding Wilds, Scatter wins, and a payout ratio of 96.5%, you will surely love to stay a while in this exciting adventure-themed slot machine game of Hall of Gods! So, get ready to board a Viking ship, battle the Midgard Serpent, have fun playing, and experience the adventure of a lifetime in Hall of Gods! Even if the Hall of Gods seems like a pretty simple online video slot machine game, Net Entertainment truly does not disappoint on this one when it comes to the quality of the graphics and sound. You will see the background of the sea wherein Jormungand, the Midgard Serpent, is going to cause trouble and attack some Viking boats. The symbols are nicely drawn in a cartoonish way, and it does not hurt or strain your eyes. The overall graphic design of Hall of Gods showcases many colors such as blue, green orange, yellow, red, purple, and gold. Hall of Gods has sound effects that will surely make you imagine that you are traveling across the turbulent and wavy sea. The heavy sound of the wind and waves perfectly complements the theme of Hall of Gods. When you spin the reels and hit a winning combination, celebratory music coming from different instruments such as drums and trumpets fill your ears. If you have activated the Free Spins bonus game, there is a constant drumming sound in the background being played. In Hall of Gods slot game, there are no card deck symbols being used. The regular symbols they have used in the Hall of Gods complement the Norse mythology theme perfectly, such as Odin (the ruler of Asgard), Thor (god of thunder and lightning), Freyja (goddess of love, beauty and fertility), Idun (a goddess associated with youth and apples), and Loki (the trickster fire god). Other symbols used in Hall of Gods pertain to the items owned by the characters mentioned above such as the Magical Gold Ring, Thor’s Hammer, Necklace, Apples and War Hammer. The Wild Symbol is Jormungand, the Midgard Serpent. It functions as an Expanding Wild symbol, which has a useful ability that all online slots players love. Expanding Wild symbols automatically expand in order to cover the whole reel they appear on, if it results in a bet line win. The Jormungand Expanding Wild symbol only appears on reels 2, 3, and 4. The Expanding Wild symbol substitutes for all symbols (except for the Scatter symbols). Please take note that the Jormungand Expanding Wild symbol will not expand to all positions on the reel if there are no winning combinations on the pay lines. In Hall of Gods, there are 2 Scatter Symbols – the Ravens and the Hammer and Shield Bonus scatter symbols. Scatter symbols mean that they do not need to appear in a line (on an enabled pay line) for you to win. • The Ravens scatter symbol can be scattered anywhere on the 5 reels for you to complete winning combinations, as long as there are 3 or more Ravens scatter symbols that appear. If you hit 3 or more Ravens scatter symbols, you will activate the Free Spin Bonus Feature game. • The Hammer and Shield Bonus scatter symbol only appears on the 3rd, 4th, and 5th reels, and as long as you get 3 or more of these scatter symbols to appear simultaneously, you will activate the Hall of Gods Bonus Feature game. Please take note that the Ravens and the Hammer and Shield Bonus scatter symbols do not give you any winnings at all; however, they are your ticket to enter their respective Bonus Feature games. The Hall of Gods online video slot game has awesome 3 progressive jackpots up for grabs! When it comes to Progressive Jackpots, do take note that they are a constantly accumulating prize. Every time a player plays the Hall of Gods slot machine game, a portion of their bet is added to the Jackpot prize. In the Hall of Gods slot game, you will find the most recent value of the Progressive Jackpots displayed at the topmost area of the reels. A slot player can win the Progressive Jackpot during the Hall of Gods Bonus Feature game only. Simply match 3 Mini, Midi, or Mega Jackpot symbols to win the corresponding jackpot prize! The Hall of Gods Progressive Jackpots are actually available in both Fun and Real Play modes, but with separate funds. The first Bonus Feature game is the standard one, a Free Spin Bonus Feature game. It is triggered when you hit 3 or more Scatter Symbols (Ravens) that are scattered anywhere on the 5 reels. If you hit 3 Scatter Symbols (Ravens), you will be rewarded 10 Free Spins; if you hit 4, you will be rewarded 15; and if you hit 5, you will be rewarded 20 Free Spins! All of the winning combinations that you hit during the Free Spin games are tripled! Another great thing about their Free Spin Bonus Feature game is that if you manage to hit another 3 or more Scatter Symbols (Ravens) while playing the Free Spin game, you are rewarded another set of 10, 15, or 20 Free Spins! The extra Free Spins you get are then added to the remaining number of Free Spins. During the Free Spin Bonus Feature game, you can be awarded an infinite number of additional free spins! When the Free Spin Bonus game is over, you are then taken back to the regular Hall of Gods slot game, and all of your Free Spin game wins are added to your total win. The second one is the Hall of Gods Bonus Feature game. It is triggered when you simultaneously get 3 or more Hammer and Shield Bonus (scatter symbols) which can be scattered anywhere on the 3rd, 4th and 5th reels. What’s awesome about the Hall of Gods Bonus Feature game is that you can win 1 of 3 Progressive Jackpots! You will simply click on the Shields to reveal Jackpot symbols and/or Bonus Prize coin amounts. You can win the Progressive Jackpot amounts when you match 3 Mini, 3 Midi or 3 Mega Jackpot symbols. Alternatively, you can match 3 Bonus Prize coin values and win the matching amount! In a progressive jackpot, the more you bet, the more chances you have of winning! When the Hall of Gods Bonus Feature game is over, you are then taken back to the regular Hall of Gods slot game and your bonus game wins are included to your total balance. Do take note that the Hall of Gods Bonus Feature game can be activated even if you are currently playing the Free Spin Bonus games; however, the Free Spin multiplier does not multiply the winnings that you will win when you are playing the Hall of Gods Bonus Feature game. Hall of Gods online video slot game has 5 reels where you may bet on 20 pay lines. The minimum bet is 0.01 and the maximum bet is 0.50 per line. You can wager from 1 up to 5 coins. It is absolutely more fun and easy when there is an Autoplay function available in online slot games. In Hall of Gods, you can actually access their Autoplay function in two ways: click on the Autoplay button on the lower left corner of the screen, or you can simply click on the Autoplay button located just beside the Spin button of the game. You can choose how many spins that the Autoplay with spin automatically for you – it can be from as low as 10 up to as high as 1000! You can even customize their Autoplay by clicking on the Autoplay button and going to the Advanced Settings menu. You can choose to Stop Autoplay when you manage to win on a spin, if free spins are won, if the bonus game is won, if a single win exceeds a certain amount, or if the their cash increases or decreases by a certain amount. When you are satisfied with the Autoplay settings, you only have to click Start and the Autoplay will spin automatically for you.